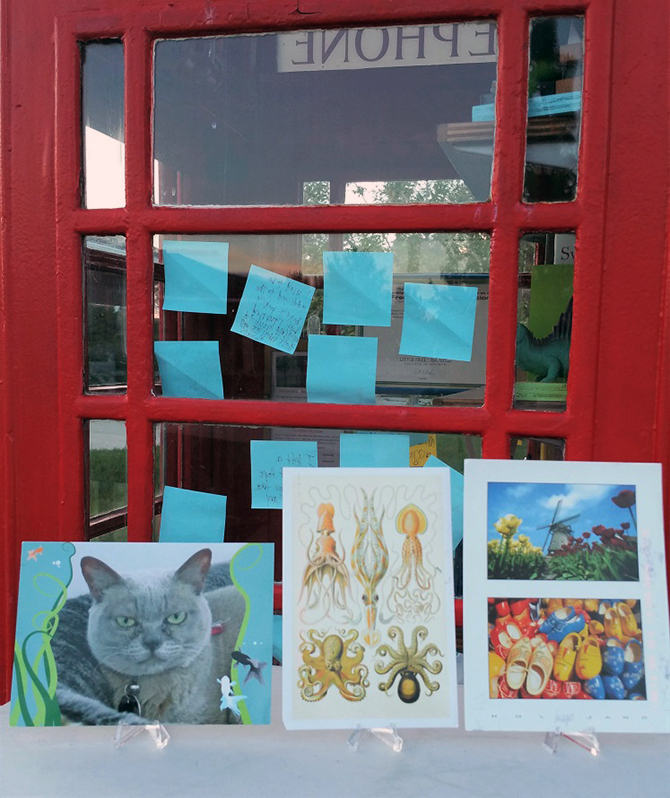 Postcrossing Spotlight: M and Sir Owen! 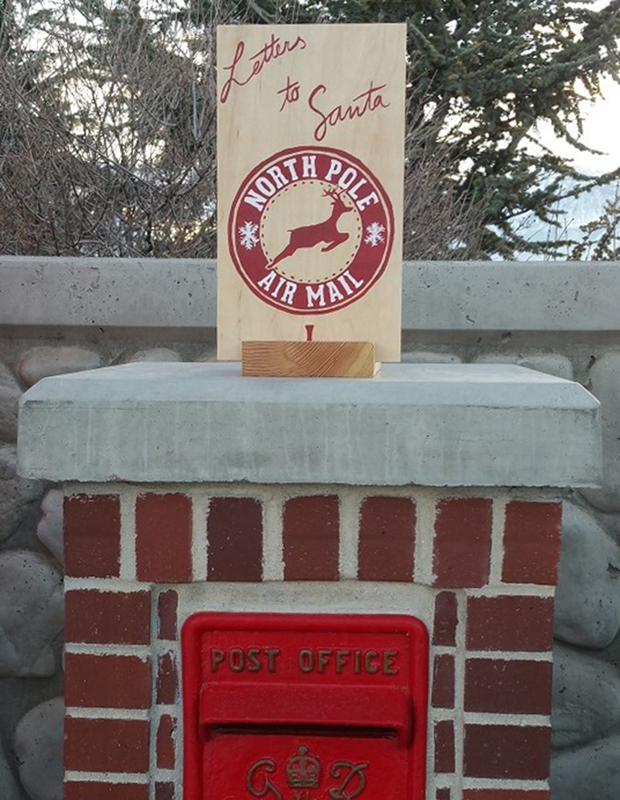 We’ve written about postboxes on the blog before, like the very old post office tree in South Africa, or the barrel postbox in the Galapagos… but did you know there’s a very special postbox in Utah that has its own Postcrossing account? Could you introduce yourselves to the community? M: Certainly! I am Dame Mavis Margaret, although my friends all call me 'M’. I was named after two female code breakers at Bletchley Park during World War II. Have you ever seen the movie, “The Imitation Game”? That was the place. There were around 10,000 people working to break codes in secret during those years (and that’s just the people! There were also telephone boxes, telegraphs, post boxes, and a not insignificant number of spy pigeons — but that’s another story). As an anthropomorphised Post Box, I came into service in 1941. 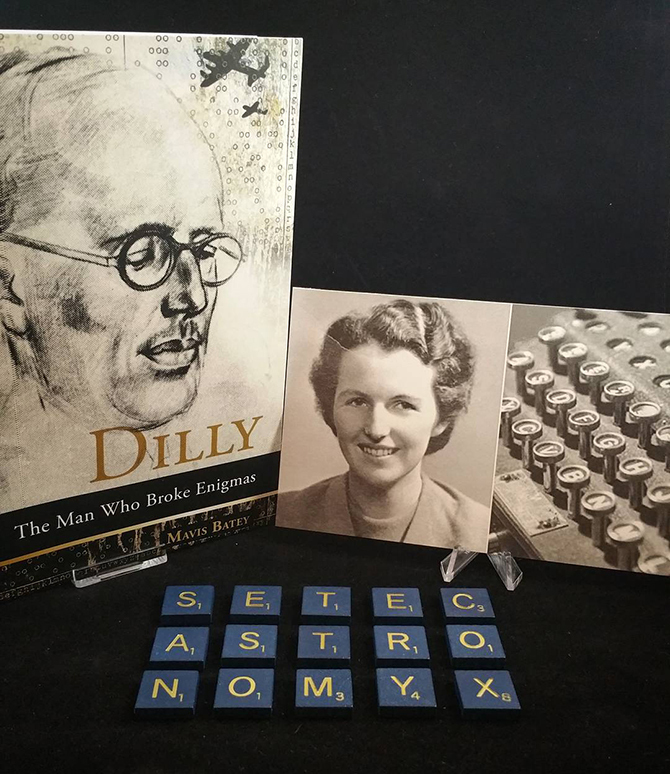 Mavis Batey, a code breaker at Bletchley Park during WWII, and one of M’s namesakes. Sir Owen: I am Sir Owen St. George, named after the Royal Librarian of Kings George V, VI, and the first years of Queen Elizabeth II. As an anthropomorphised telephone box I came into service in 1936, and also got involved in the code breaking efforts during the war. M. and I first worked together at Bletchley, then stayed in intermittent contact after the war — she stayed in England, while I immigrated to Las Vegas, Nevada in the United States in the 1970s, (though still in the capacity of a functioning telephone box — I wasn’t decommissioned until the early 2000s). What is South Jordan like? And how did you end up there? 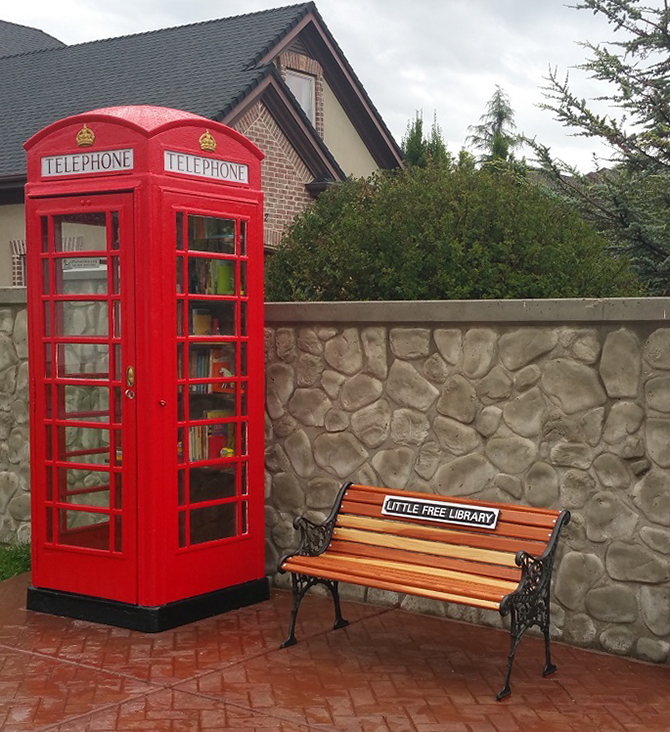 Sir Owen: South Jordan is just lovely — it’s located about 25 km southwest of Salt Lake City, the capital city of Utah. As a former farming community that has become increasingly developed and suburban, there are plenty of parks and open spaces, though some neighbourhoods can be quite spread out and not feel very walkable. Everyone seems to favour their Sport Utility Vehicle or Minivan! Which leads to how I happened to relocate to South Jordan. My stewards had wanted a Little Free Library or neighbourhood book swap for several years: an opportunity to share their love of books and reading, but also to provide a reason for families, friends, and neighbours in the community to get out walking, interact, and share a smile. 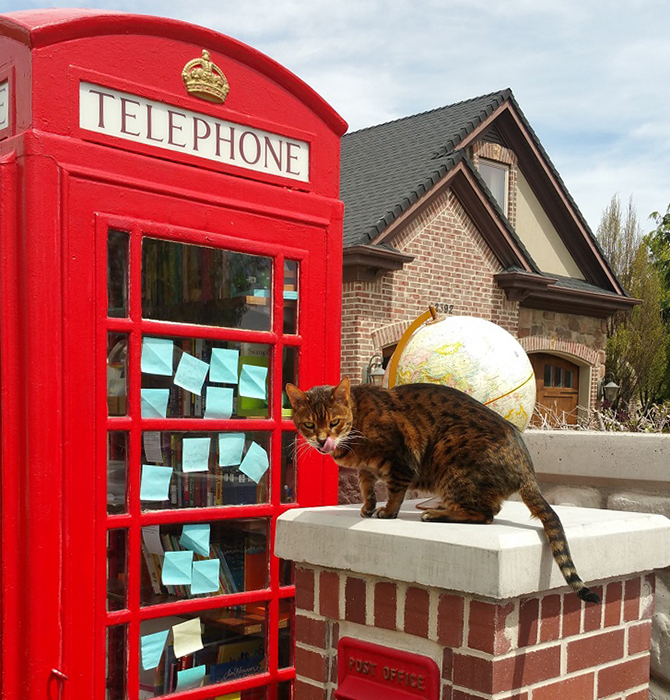 And what can do that better than free books in a British telephone box? They investigated having one restored and shipped from England, but when they happened upon me outside a Las Vegas antique store, it was an ideal match for all of us. Sir Owen without M. Doesn’t he look a bit lonely? 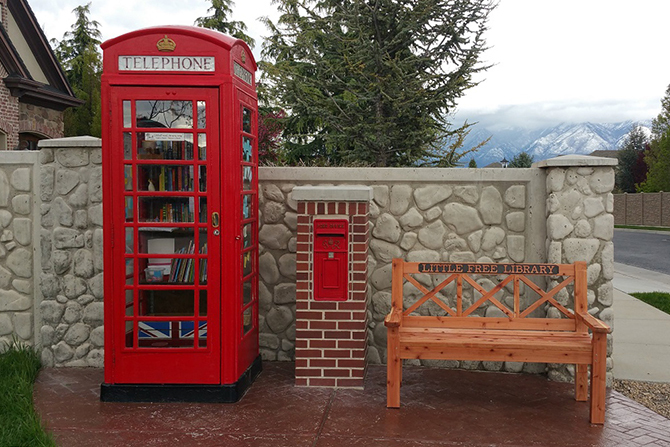 M: Sir Owen relocated to Utah and began his days as a Little Free Library in August of 2015. He enjoyed his new surroundings so much that he asked if I might consider joining him. I had been retired for some years at that point, but know that whatever our age or position, we can all find new purpose and be useful. I immigrated in mid 2016, and my stewards finally had my brickwork completed last October. How did you find out about Postcrossing? What made you stay? 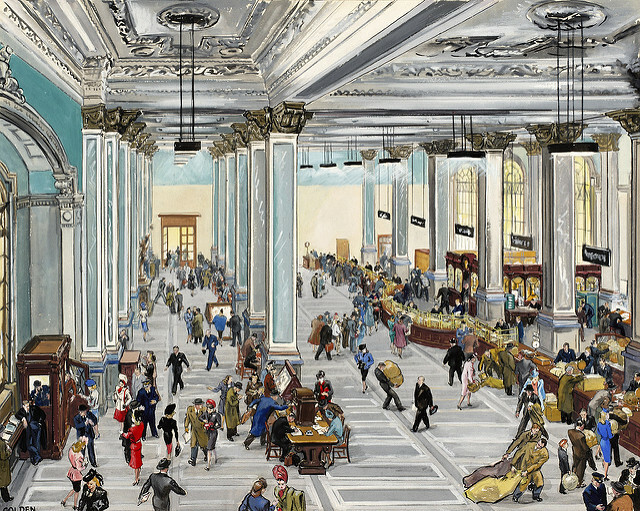 Do you have a favourite postcard you’ve received? Sampling of postcards that M has received. M: I have received so many wonderful and beautiful postcards! Honestly the ones I remember the most are the ones where someone shares something about themselves or why they chose the particular card they sent. A lovely Postcrosser (and self-proclaimed “Crazy Cat Lady”  ) in Switzerland recently sent me a postcard she had made which included a picture of her cat who lived over 16 years! Our library cat Locutus also turns 16 this year, which gave us each a chance to connect and reflect on our benevolent feline overlords. Locutus the Library Cat will occasionally deign to visit, if treats are provided. Do you do anything special with the cards you receive? A world map mural, perfect for marking all the postcards sent and received. 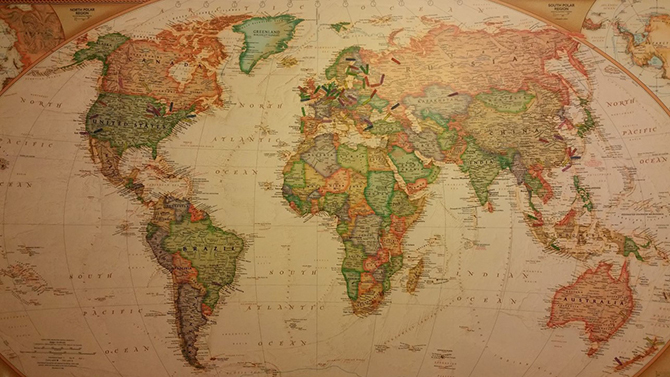 M: My stewards have a large (2 meters x 3 meters) world map mural in the family office. Each postcard sent and received gets a small sticky tab showing were it was received from (or sent to), the number of days it took to be delivered, and distance sent. Their children love learning about the geography and cultural details of so many people across the globe! I also feature many postcards that I’ve received on Sir Owen’s Instagram account, which helps share the Postcrossing fun with his followers in the Little Free Library and larger “Bookstagram” community (which, perhaps unsurprisingly, includes a lot of existing Postcrossers and has convinced others to join!). Do you get many visitors everyday? Sir Owen: Yes! Although technically located on my stewards’ property, they intentionally located us next to a walking path that many children use to go to and from the local primary school. 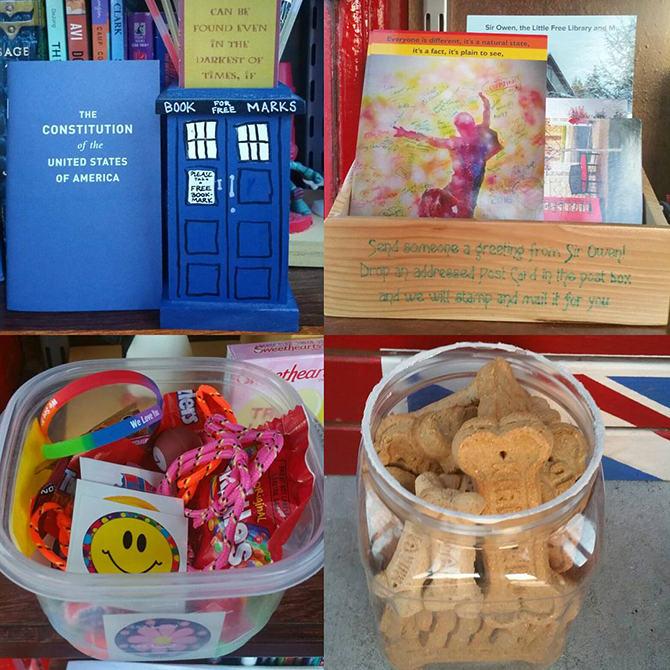 My stewards try to keep my shelves stocked with a good selection of books, but there are also other reasons to stop by — free bookmarks and treats, colouring pages, doggie treats, and of course blank postcards to send to a friend! If patrons address them and place them in M, my stewards will even affix postage and mail them via USPS on their behalf. Various surprises for patrons. Oh, and don’t forget a book while you’re here! 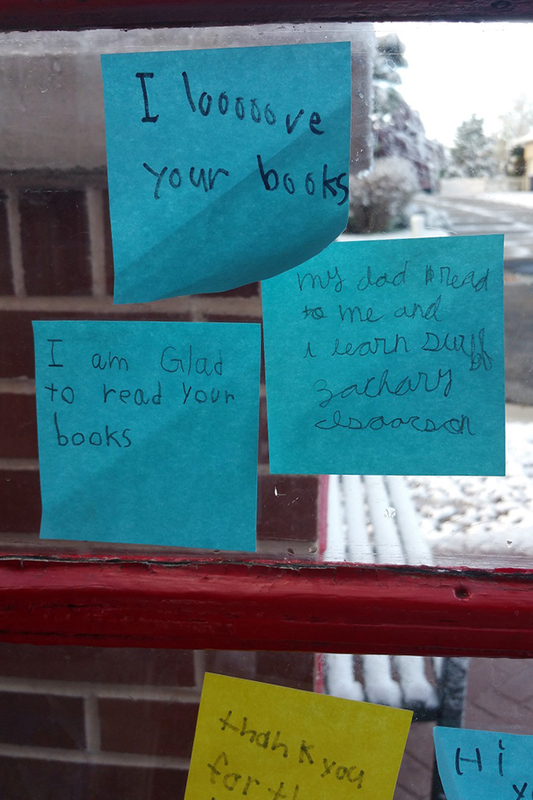 Visitors love leaving Sir Owen and M (and each other) notes on the windows when they visit. How does the free library work? 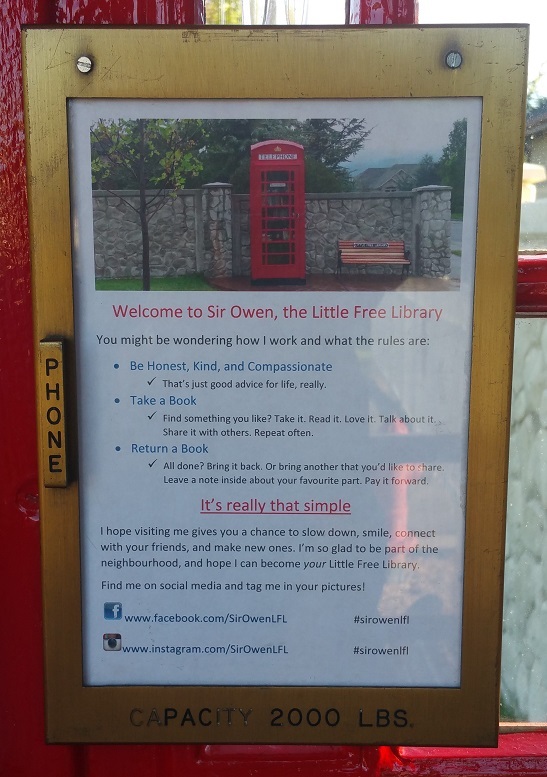 Sir Owen: While the motto of a Little Free Library is “Take a Book, Leave a Book”, there’s no expectation that you have to leave a book in order to take one. The purpose is to share the love of reading and build community! If you like a book that you take, you can keep it forever. Or you can share it with a friend, or even return it to another Little Free Library in a different neighbourhood. Similarly if patrons have books they’ve enjoyed that they’d like to share with others, they can place them in my returns and donations bin under my bottom shelf (emblazoned with the Union Jack, of course). Sir Owen’s Rules. The first rule is by far the most important. I have five shelves organized roughly by age, from picture books on the bottom shelf for children, up through primary and secondary school, young adult, and books for grown-ups. While most of my selections are donated, my stewards also enjoy curating books to ensure I have a good selection for all reading levels (one steward has become quite familiar with the local thrift stores), as well as for particular holidays and themes throughout the year. My favourite celebration? Banned Books Week — celebrated the last week in September every year with the American Library Association. I’ve rediscovered classics and found so many new and interesting ideas that way! M loved being an official drop-off for letters to Santa this past Christmas. 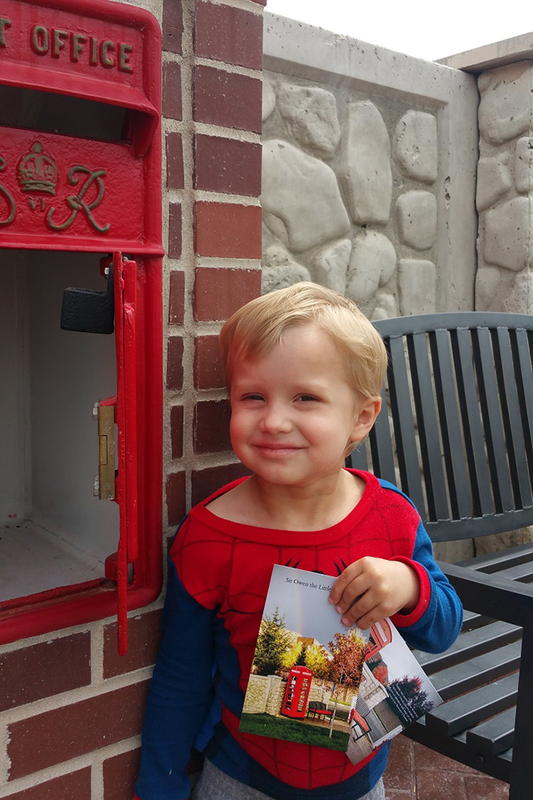 The youngest child of Sir Owen and M’s stewards loves checking M every day for new postcards to mail for patrons. Sir Owen: I no longer feature a telephone; that leaves more room for books! However about a week after I opened, a kindly gentleman visited me and gave me a frame that had once housed the emergency telephone in a lift. As you saw above, I use it now to welcome patrons and explain what a Little Free Library is. Sir Owen and M: Why, books, reading, and Postcrossing of course! Our stewards also think there might be a faerie garden in our future, as well as a couple of other surprises still in the works. One of our stewards says that if he could figure out how to pay the bills by purchasing books at thrift stores and then giving them away for free, he’d retire and steward for us full time (well, that and tend the royal beehives  ). Our other steward (by far the more handy of the two) enjoys creating amazing projects for us in her growing wood shop (such as Sir Owen’s bookshelves, and our brand new bench featured in the first picture above!). Sir Owen and I plan on being here happily giving people a chance to slow down, share a smile, and build community, both in our local neighbourhood and across the world. Thank you Ana for letting us share our story! 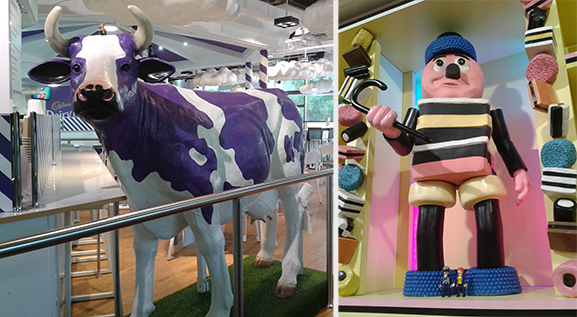 Once again, we give the Little Mail Carriers center stage, so that they can finish telling us about their adventures in Leicestershire (here’s part one of their adventures in the UK, in case you missed it)! Naturally, we wanted to take part in a Postcrossing meeting whilst we were in England, which we did with our host, her sister and cousin. They have quite a collection of postcards between them and we liked picking out cards to send which showed typically British images. 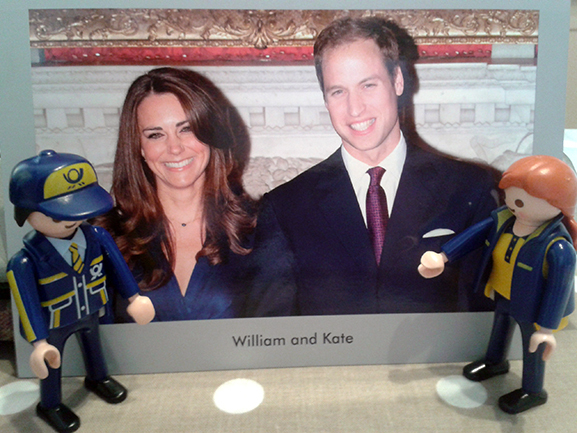 Our favourite was a postcard of William and Kate; the closest we got to meeting any Royalty whilst on our visit! During our stay, on 9th September 2015, Her Majesty The Queen became Britain’s longest serving monarch, having been on the throne for 63 years and 7 months. This surpasses the reign of her great-great-grandmother Queen Victoria. We were really interested to learn more about Queen Elizabeth II and her reign and lots of the newspapers had special editions on this day. We were also very excited to hear that Royal Mail have released a limited edition First Class Definitive stamp in regal purple. The stamp is usually red but will stay purple for 12 months to mark this historic occasion – cool! 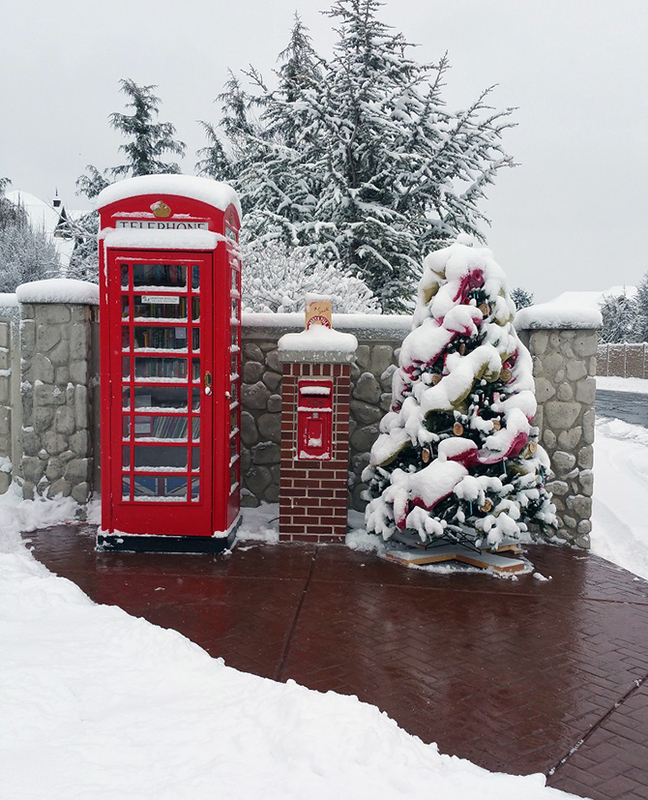 Of course wherever we are in the world we like to check out the mail boxes and no trip to the UK would be complete without seeing some of those iconic red post boxes! 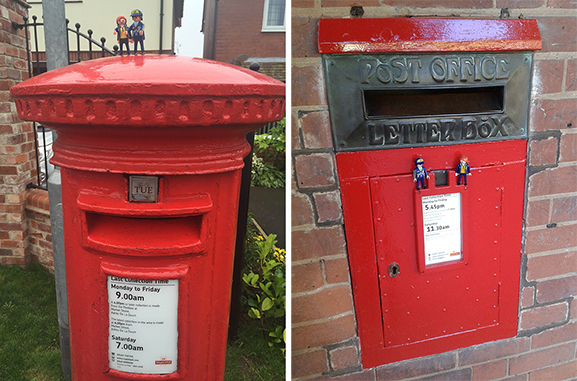 We were lucky to see a few during our visit, including a traditional pillar box, a very old post box in ">Birmingham, and even a miniature replica (almost the perfect size for us!). 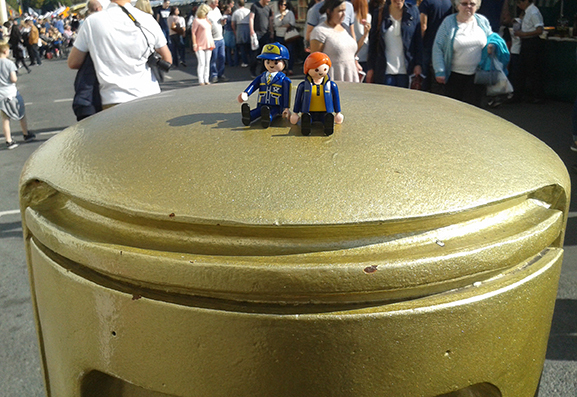 Our favourites though were these two very special gold post boxes in Stratford-upon-Avon. Royal Mail has painted more than 100 of its post boxes gold to celebrate every GB gold medal won during the London 2012 Olympic and Paralympic Games. 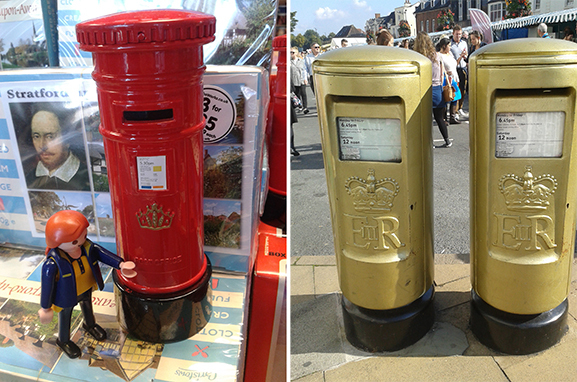 The post boxes will remain permanently gold to mark the achievements of the athletes and the historic Games – wow! These two are in honour of the appropriately named paralympian rower James Roe. 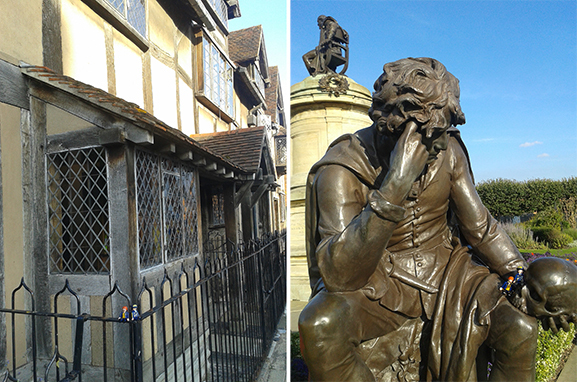 We loved our day trip to Stratford-upon-Avon, where we enjoyed all things Shakespeare, including visiting the Shakespeare Centre and Shakespeare’s Birthplace, posing with a statue of Hamlet, meeting a giant Shakespeare teddy and stocking up on British souvenirs! 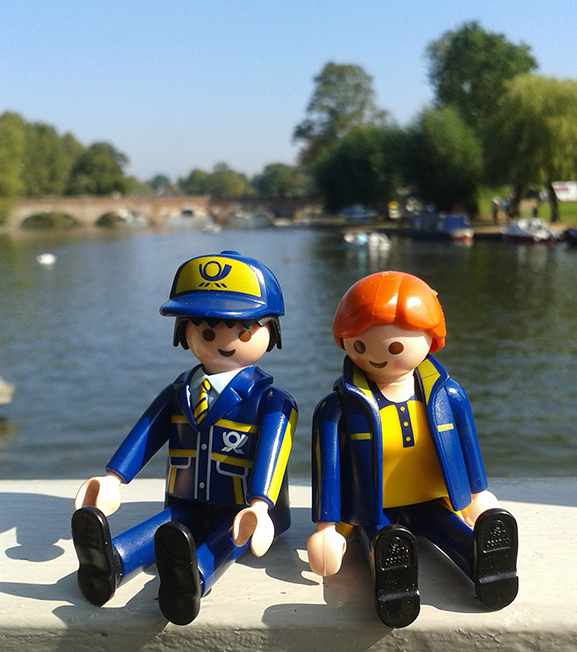 We also enjoyed watching boats in the sunshine on the canal. 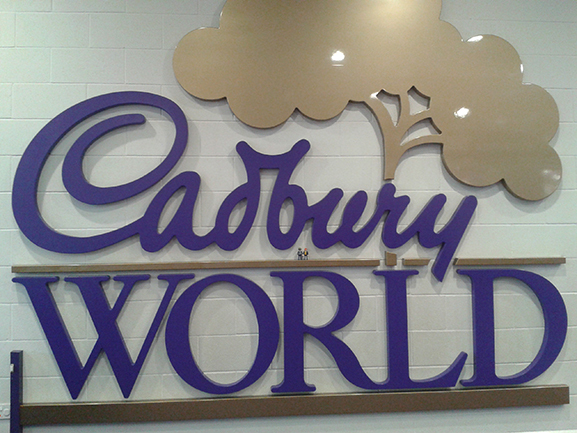 On the final day of our visit, we were treated to a trip to Cadbury World in Birmingham, home of the world famous Cadbury chocolate! As soon as we got out of the car, we could smell the delicious chocolate in the air! 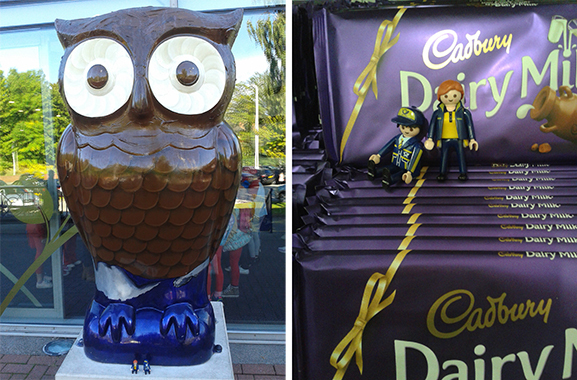 There was plenty of chocolate to be found inside of course, as well as the chance to make some new chocolatey friends; the Cadbury Buttons owl, a purple and white cow and even Bertie Bassett himself! Phew, what an exciting trip! 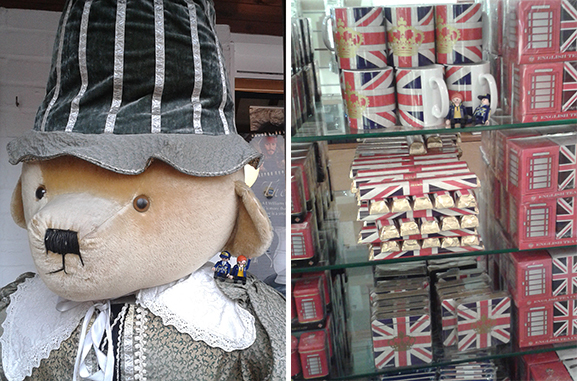 We had a great time visiting the UK and can’t wait to go back again soon. 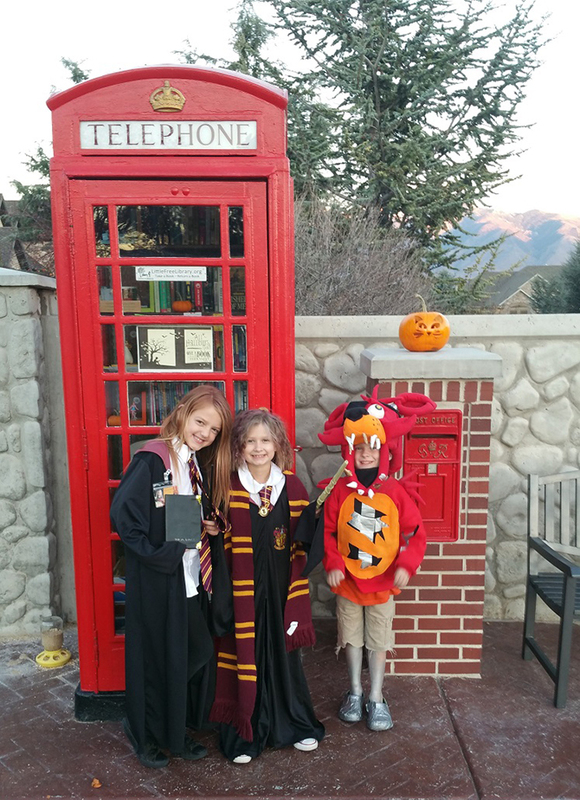 Our heartfelt thank you to Sophie (aka FlyingGiraffe) for hosting the little guys and taking them on so many adventures!